Now that we've looked at all the wrong ways to do SEO, it's time to put on the white hat and learn what works in compliance with search engine rules. Keep something in mind though; it's estimated that Goggle makes about 500 tweaks to their algorithms every year. That means the rules are in constant flux. What's worse is that they never publicize exactly what rule changes comprise. That alone is enough to keep any SEO expert on their toes, but Google does provide hints in their webmaster tools. So does Bing/Yahoo for that matter. You can learn more about the Google and Bing/Yahoo webmaster tools here and here. Wait for the Prize. Slow and Steady Wins the Race! Think of it this way. If you opened a brick and mortar operation, you might advertise in the yellow pages, hand out flyers around the neighborhood, etc. in order to draw traffic to your store. Customers visit because of your initial efforts, but if you want those customers to keep coming back again and again, it takes building a relationship. On the internet, your neighborhood is quite literally the entire world. Drawing traffic though is much different. You could advertise, but advertising can be expensive. Ideally, you would draw traffic to your site through search engines. Customers will visit your site, but what do you do to keep them coming back again and again? And, what get's you noticed by search engines in the first place? 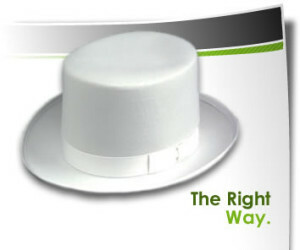 Good White Hat SEO helps build the relationship with your web customers. With White Hat, it's all about the content, relevant content, and more relevant content. Did I mention relevant content? What is relevant content? It's content that is relevant to your business and your customers. If you are in the import/export business, would your customers want to read about Tim Tebow getting traded to the Jets on your site? No. They'll visit a sports relevant site. Stick to content that is relevant to your business. Description: Often a meta tag, should not exceed 165 characters in length, include your keyword phrase in the description. The description displays on the search engine results page (SERP). Use the description to show how you can solve a problem or as a teaser to get the user to click on your link. Don't use the description to repeat text already convered in your ssrticle. Hyperlinks: As a general rule of thumb, there should be 1 hyperlink for every 120 words. At least 1 of those links should be at the beginning of the article to show prominence. Flesch Reading Ease Score: one of the best-known and most popular readability indicators which rates text on a 100-point scale based on the average number of syllables per word and words per sentence. The closer the score is to 100, the easier the content is to read; the closer the score to 0, the more difficult the content is to read. Research indicates that a score of 70 is likely appropriate for adult readers. A score of 100 represents that the content is understood by readers with at least a fourth grade education. Keyword Density – the number of times a keyword or keyword phrase appears in a particular piece of content in relation to the total number of words in the content. Current SEO best practices suggest that a keyword's density be less than 5% for one piece of content. Awesome techniques Victor, white hat can take more time but it is good to follow white hat instead of black hat techniques. Nice White hat SEO Techniques . For white hat we want to follow search engine rules. Tips are really nice. Better have a tip on image keyword inclusion as I have pointed in my web …keep writing! White hat seo is that works in compliance with search engine rules. White hat seo means we have to follow the terms and condition of search engine. Nice to visit this post. Really nice and useful information. I really appreciate this post. Thanks for sharing. Tips are really amazing and i appreciate it for sharing them..Great Post!